Dianna Ferenz presents her paintings at Rolling River Spirits April 3 – 26. Artist’s Reception Friday, April 3, 5 -8 pm. “For everything that is unique to an individual, if it does not wish to be silent, needs its proper language.” (Rilke) My mode of language is painting in a highly abstracted voice of dream, poetry, myth. 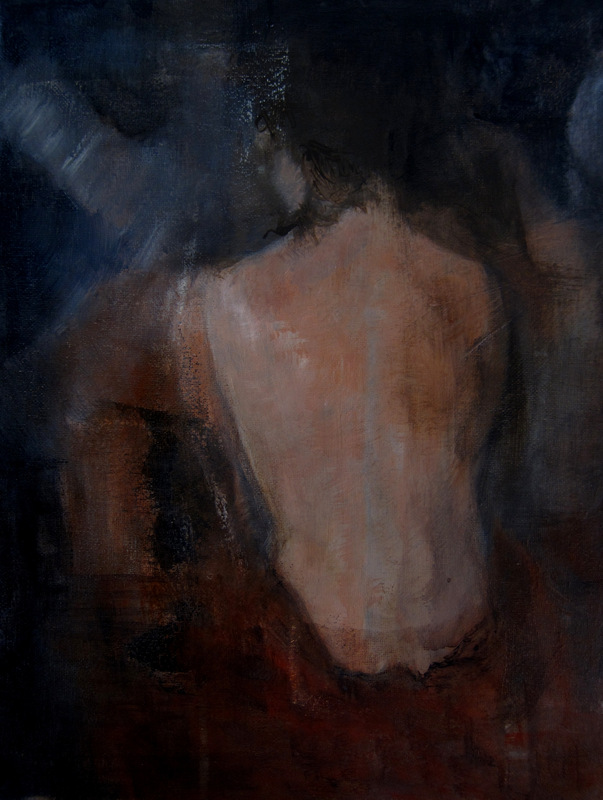 Between space and shadow, paintings emerge more stream of consciously than contrived. My work have been described as ethereal, evocative, emotive, sometimes nostalgic–perhaps trying to capture fleeting moments-the viewer adds the signified. Solitude and silence provide the back space for these reflections; themes of mirrors, water and night recur. Join us this Friday, April 3 from 5:00 to 8:00 pm for First Friday – Portland’s Eastside Artwalk. Dianna will be there from 5:30 to 7:00 pm. Secrets of Perfect Cocktails Revealed! What better way to learn to improve your cocktail game than to go straight to the source? Let the master craftsmen of Distillery Row show you how it’s done! After all, they make the spirits so they know how to best bring out the subtle nuances and bold flavors of their products in both simple and more complex concoctions. Let them help demystify your cocktail! Join Eastside Distilling, Vinn Distillery, New Deal Distillery, Stone Barn Brandyworks, House Spirits, Rolling River, Wild Roots Vodka, and Thomas & Sons Distillery on Saturday, April 4th for an afternoon of spirits tasting and cocktail instruction. The event features all eight Distillery Row distilleries under one roof with over 50 products including gins, whiskeys, brandies, vodkas, rums, and specialty spirits. Visit each distillery booth for sampling and to learn more about how the spirits are made. Throughout the day mixologists from each distillery will present on a wide range of topics from basic mixology to more specialized tips and information—all of which will allow you to take your cocktail-making skills to the next level. The presentations will focus on “home-bartending” and offer a unique opportunity to see (and taste) first-hand cocktails you can make and serve at home. Topics include herbs and the role of ice in cocktails, balancing, introduction to bitters, making the perfect punch for entertaining, tools of the trade, infusions, and more. The Cocktail Demystified is designed to get you up and running as a home bartender. You’ll be able to taste new spirits, learn how to use them in cocktails, receive recipes, and even buy the spirits to take home. So fear no more … come learn how to conquer the cocktail! Join us and 40 other distillers this weekend at the Leftbank Annex, March 7th, 4pm-10pm for the 5th annual TOAST. The 5th Annual Toast event is an opportunity to taste from a wide variety of over 120 spirits from across the Northwest, the Country and the Globe. TOAST allows small distillers and producers to showcase their handcrafted spirits, while providing an opportunity for the public to experience the diversity and quality of craft spirits from Oregon and beyond. Join us on Friday March 6 from 4:30 to 8 pm for First Friday – Portland’s Eastside Artwalk. The Spirit of the Work: This series of paintings represents years of developing not only a personal style, but a new technique for creating a sustainable series of exciting paintings. I use the term “Organic” for any of my images that neither represent nor are abstracted from some real subject, but are entire compositions that grow spontaneously and innocently of themselves. 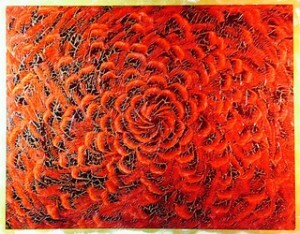 The term “Vortex” refers specifically to my organic pieces created by cutting spiral patterns into thick oil paint.